Palm OS 5.2 is mainly a bugfix release, first implemented in the Samsung SGH-i500 in March 2003. 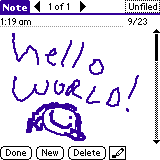 It added support for 480x320 resolutions and introduced the new handwriting input system calledGraffiti 2; the new input system was prompted by Xerox' lawsuit win against Palm. Graffiti 2 is based on Jot from CIC. The last bugfix release is version 5.2.8. 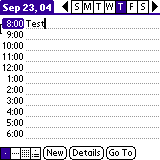 Garnet OS 5.5 dropped the Palm moniker and, as of 2007, is the current version developed by ACCESS. This version is dedicated for use inside of the Garnet VM virtual machine. Garnet VM was announced and released by ACCESS in November 2007 as a core part of the Access Linux Platform and as an emulator allowing Nokia Internet Tablets to run applications written for the Garnet OS. In June 2010, ACCESS release Garnet VM version 6 (aka Garnet VM Beta 6 1.05b). HotSync integrates with the user's PC. Usually activated by a press of the physical HotSync button on the Palm's cradle (a dock station), this application communicates with various conduits on the desktop PC to install software, backup databases, or merge changes made on the PC or the handheld to both devices. It can communicate with the PC through a physical connection (USB on newer models; although drivers for Windows x64 based platforms are still unavailable, 32 bit editions work well), Bluetooth or IrDA wireless connections, and direct network connections on devices with networking capability. To Do List item can be sorted by: due date, priority or category. The newer Tasks app features the following improvements : new interface, repeating tasks, alarms, etc. 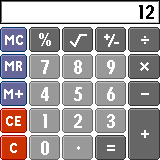 A free development tool, LaFac, works directly on the Palm device, using the Memo Pad for source code editing, and provides support for a limited subset of C, Pascal, and Basic. Xerox vs. Palm Computing (1997) - In 1997, Xerox was granted U.S. Patent 5,596,656 covering the "Unistroke" input system developed by Xerox PARC in 1993. Xerox filed suit against Palm (then U.S. Robotics), alleging that Palm's Graffiti infringed on this patent. The Palm OS switch from Graffiti 1 to Graffiti 2 was triggered in part by Palm losing this lawsuit to Xerox. The patent was invalidated in May 2004 due to prior art developed at Bell Laboratories in 1982. Palm vs. Microsoft (1998) - In 1998, Microsoft planned to name the next version of their handheld computing platform "Palm PC". Palm filed suit against Microsoft, forcing the name change to, first,Palm-sized PC, and later, Pocket PC. Last updated on 20 August 2014 at 11:43.